July 21, 2015 – (Reuters) – A faulty metal brace in an unmanned SpaceX Falcon 9 rocket likely triggered the explosion that destroyed the booster minutes after liftoff from Florida last month, company chief Elon Musk said on Monday. The June 28 accident, which destroyed a load of cargo destined for the International Space Station, was the third botched resupply run within eight months. An Orbital ATK rocket explosion claimed a Cygnus cargo ship in October and a Russian Progress freighter failed to reach orbit in April. SpaceX founder and Chief Executive Musk said Falcon rocket flights will not resume until September at the earliest. The company also plans to delay the debut flight of its heavy-lift Falcon rocket from this year to spring 2016. 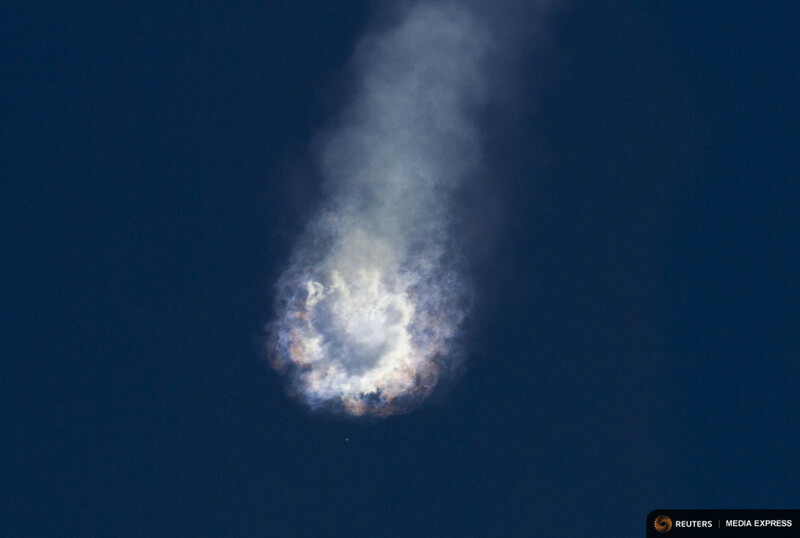 A defective brace, or strut, holding a bottle of helium in the Falcon 9 needed to pressurize the upper-stage engine’s liquid oxygen tank, was the most likely cause of last month’s accident, Musk said. He said the strut, from a vendor he declined to identify, was built from steel certified to withstand 10,000 pounds (4,536 kg) of force but apparently failed at 2,000 pounds (907 kg) of force, Musk said. “It looks like the key strut that holds down one of the helium bottles failed. As a result, the helium bottle would have shot to the top of the tank at high speed,” Musk told reporters on a conference call. “It failed five times below its nominal strength, which is pretty crazy,” he said. SpaceX not only intends to buy new struts, most likely from a different vendor, but test each one prior to installation in the rocket’s tanks, Musk said. SpaceX had successfully flown its Falcon 9 rocket 18 times since its debut in 2010 before the June 28 failure. During those flights, thousands of similar struts apparently worked with no issues. “We have been able to replicate the failure by taking a huge sample, essentially thousands of these struts, and pulling them. We found a few that failed far below their certificated level. That’s what led us to think that there was one just far below its rated capability that happened to be at the wrong place at the wrong time,” Musk said. The results are preliminary, he added. In addition to the bad strut, SpaceX is looking for other issues that may have caused or contributed to the accident, as well as any potential problems that could affect future flights. “This is the first time we’ve had a failure in seven years, so I think to some degree the company as a whole became maybe a little bit complacent,” Musk said. The company has a backlog of more than 50 rocket launches, worth about $5 billion, for commercial companies, NASA and other agencies.